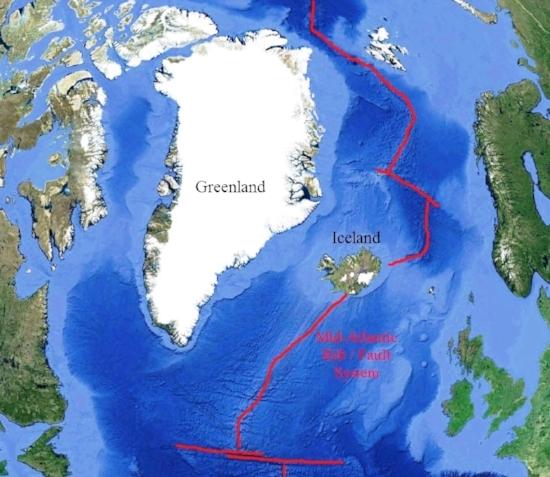 Figure 1: Seafloor trace of the Greenland / Iceland portion of 14,000-mile-long Mid-Atlantic Ridge / Fault System (red line). The most plausible scenario for southern Greenland’s surface ice melt is related to geologically induced heat flow and not atmospheric warming for various, well-established reasons. Based on research by the National Oceanic and Atmospheric Administration (NOAA) (see here), the top surface of southern Greenland’s ice sheet is currently melting at a high rate and therefore greatly reducing surface ice volume. They attribute this geographically localized melting effect to an unusually persistent and man-made atmospheric high pressure system (a so-called Omega Block) that has remained stationary above southern Greenland during the spring of 2016. This non-moving high-pressure system has trapped a cell of very warm air above southern Greenland resulting in higher-than-normal surface ice melting rates and volumes. NOAA and the mainstream media are portraying this above-average melting as undeniable proof man-made global warming damaging our planet. This portrayal is vastly misleading. The MAR (Figure 1) is also the equidistant boundary between two separate and very large crustal plates that make up Atlantic Ocean’s seafloor. The plates are literally being pulled apart by powerful geological forces, known as a “slow-spreading” ridge. Running along the crest of the MAR is a rift that is about 50 to 75 miles wide. This Mid-Atlantic rift is where the seafloor is spreading apart and where molten magma from beneath the Earth’s crust is constantly gushing up, cooling, and eventually pushed away from both sides of the mountainous ridge. These forces act to periodically open even longer and wider vertical fractures along segments of the ridge system that tap into the large magma chambers below. This process generates a localized seafloor circulatory system, which super-heats massive amounts of seawater into the overlying ocean. They can last up to a year or longer. When this recurring expulsion occurs along the southern Greenland and Iceland segment of the Mid-Atlantic rift, it significantly warms the waters above, creating a warm cell or blob. The blob of warm ocean water is pushed southwest by strong Deep Ocean currents, and gets banked against the southern Greenland shoreline. These warm blobs also alter the local climate by changing the strength and direction of surface winds, alter storm patterns, and most importantly, generate stationary high-pressure systems (Omega Blocks) known as warm blobs. 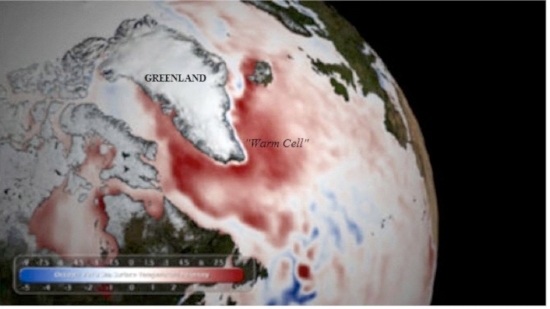 Figure 2: Map from May 2010 illustrating the 2009-2010 North Atlantic Ocean “Warm Cell” (shaded red). Proof supporting this phenomenon is compelling and reliable, because it’s happened before. The well-documented 2009-2010 southern Greenland Ocean “warm cell” (Figure 2) occurred for the same length of time, had a limited geographical location, and persisted as long as the 2009-2010 southern Greenland surface ice melting. Secondly, the ongoing 2016 surface ice melting, or the southern Greenland Omega Block, is also associated with a rapidly building southern Greenland Ocean warm cell as per shallow sea surface (SST) anomaly maps. This latest Omega Block, or high-pressure system, is occurring in the same exact limited geographical location as the 2009-2010 event. The awesome power and far-reaching influence of the 2009-2010 southern Greenland Ocean warm cell is famous for another reason, it caused the 2010 Gulf Stream “Shutdown” as described in a previous Climate Change Dispatch article (here). Noteworthy, atmospherically induced weather events such as hurricanes, typhoons, and land-based tornado-strength storms never occur in the same location. Conversely, climate events induced by a fixed geologically induced event occur at the same geographic location. “The Ridiculously Resilient Ridge is characterized by a broad region of positive geopotential height anomalies on monthly to annual timescales. This persistent ridging acts to "block" the prevailing mid-latitude Westerlies, shifting the storm track northward and suppressing extratropical cyclone (winter storm) activity along the West Coast of the United States. Such a pattern is similar to—but of greater magnitude and longevity than—atmospheric configurations noted during previous California droughts”. The geological origin of the 2014 El Niño, which generated the “Ridiculously Resistant Ridge” was discussed in detail by previous Climate Change Dispatch articles (see here). In summary, NOAA’s research concerning what is causing the increased southern Greenland surface ice melting is fundamentally flawed for many reasons. It fails to include, or at least consider, the role a geologically induced ocean warm cells play in generating and sustaining atmospheric phenomenon like stationary high-pressure systems. It does not document why computer-generated climate models that exclusively utilize atmospheric input data can’t explain when and why these Omega Blocks will occur. The media is culpable as well. They have incorrectly characterized the observed “above average” southern Greenland melting as abnormal. It’s not. These melting rates and volumes are within the range of historical / natural values. And a first-of-its-kind year-long study showed that much of Greenland’s ice sheet is actually gaining ice, not losing it. Baltimore meteorologist Justin Berk notes that this is part and parcel on how we are consistently mislead on naturally occurring phenomenon by the left-leaning mainstream media. The geological soil, rock, and ice core records of glacial and interglacial periods conclusively prove that all ice sheets, including those of Greenland, ebb and flow from year to year. An above-average year is not proof that a trend is occurring, despite the misleading headlines. Greenland still holds many surprises as our technological prowess improves and we gather more observable information (rather than relying on computer simulations) from the nearly frozen island. A more logical explanation of what’s causing this year’s accelerated, and very localized surface ice melting, is that geologically induced ocean warm cells are the root cause, and not man-made global warming.